The virulence of a virus – its capacity to cause disease – is determined by both viral and host factors. Even among healthy individuals, infection with a particular virus may have different outcomes ranging from benign to lethal. The study of influenza viruses that cause mild or fatal outcomes reveals that defective viral genomes play a role in determining viral virulence. Defective viral genomes arise during the replication of many different viruses. They are produced by polymerase errors during copying and are incorporated into virus particles. However, because the genomes contain deletions (pictured – image credit), they are defective and cannot sustain a reproductive cycle. As a consequence, virus stocks containing defective genomes often have low infectivity. Two influenza H1N1 viruses, one isolated from an individual with mild symptoms (M-IAV) and one from a fatal case (F-IAV) were studied to determine why virulence differed. The F-IAV isolate replicated to higher titers in cell culture, and is more pathogenic in mice, than the M-IAV isolate. Accumulation of defective genomes in both cell cultures and in mice was higher for the M-IAV isolate than for the F-IAV isolate. Single amino acid changes in subunits of the viral RNA polymerase were identified which, when introduced into the genome of the 2009 H1N1 pandemic virus, led to production, in infected cells, of high or low levels of defective RNA genomes. Viruses that produce high levels of defective genomes were less pathogenic in mice than viruses that produce low levels of defective genomes. 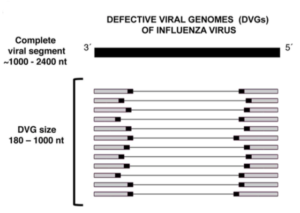 To determine if levels of defective genomes correlate with virulence in humans, a series of isolates was obtained from patients with either mild or severe influenza. In cell culture, isolates from cases of severe influenza produced ten times less defective RNA than isolates from mild cases. However, the mutations in these isolates were different from those previously studied, showing that different amino acid changes can lead to the production of defective RNA. How does the production of defective viral genomes regulate virulence? One hypothesis is that defective RNAs are good inducers of the innate immune system, leading to an enhanced antiviral state, a reduction in viral replication, and mild disease. Viruses that produce low levels of defective RNAs are poor inducers of the antiviral state; consequently higher viral replication ensues, accompanied by more severe disease. In support of this hypothesis, viruses that produce low levels of defective genomes were found to induce lower amounts of interferon-stimulated genes than viruses that produce high levels of defective genomes. Furthermore, the increased viral replication in mice associated with viruses that produce low levels of defective genomes was found to cause more infiltration of neutrophils, and depletion of macrophages in the mouse lung. These effects are similar to those observed in lethal human influenza virus infections. Central to thinking about the evolution of viral virulence is to understand the selective pressures involved. In the case of more lethal viruses that produce low levels of defective genomes, the consequence is that the virus is able to replicate to higher titers in the host. In turn, higher virus titers in the lung could facilitate more efficient transmission. As transmission to another host is a major selective force, the increase in influenza virus virulence caused by low defective RNA production makes evolutionary sense. However, as not all influenza virus strains evolve towards greater virulence, there must also be fitness costs associated with this property.